Husky Liners Floor Mats - Classic Style - Dezod Motorsports Inc - Home of the automotive performance enthusiast since 2002. Husky Liners® set the standard in automotive floor protection with the introduction of the original custom-fit floor and cargo liners. Now referred to as Classic Style™, this innovative concept provides the coverage and protection not available with a common “flat” car floor mat. The Classic Style™ includes vehicle applications starting from the mid-1970s and features a rugged looking “diamond tread” pattern, with patented “Nibs” to help keep your floor liners from shifting. 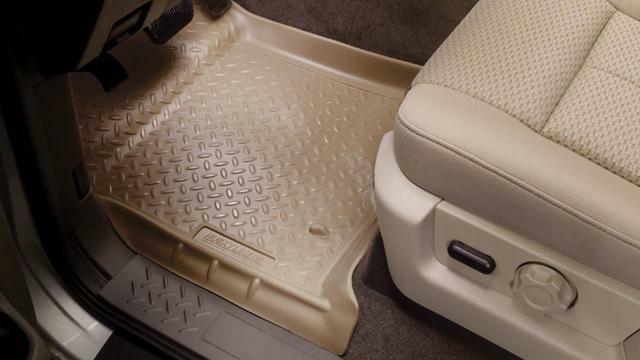 Spills and inclement weather are no match for this custom-fit floor liner, with its raised containment walls and tread pattern the mess stays away from your shoes. With a lifetime warranty against cracking and breaking, it is hard to beat the value of this great product. Designed to contour the complex surfaces of your specific vehicle’s floorboard, using the latest in laser scanning technology. Laser Scanning Technology provides a precision fit contour design for your specific vehicle’s floorboard. Raised containment walls to help keep mud, mess and spills on the liner and off your vehicles expensive, hard to clean carpet. Most late model vehicles feature the Patented Form-fit Edge™ design. Front & Back Seat Floor Liners are sold separately. Available for Front Seat, 2nd Seat, 3rd Seat, Center Hump and Cargo in Black, Grey or Tan.